Users are paired up and then read to each other in real time using either audio or video feeds. Technology has changed the way many of us read books, from the introduction of e-readers to audiobooks and interactive apps that carry users visually through a story, the medium has evolved in the digital age. Audrey is a free online reading experience changing how we interact with books in a different way, using the modern communication age as a way to bring readers together for live audio experiences as they read aloud to each other in real time and discuss the stories they are both experiencing. The online community is the brainchild of Rob Paul, a 41-year-old former school teacher from North London, who said he decided to build the programme after seeing the benefit and enjoyment his psychology students got from peer-to-peer experiences. “Combine this with my own love of reading, the enormous pleasure I get from reading aloud to my children, an appreciation that reading great books can help comfort and reinvigorate the mind, build empathy and develop relationships, and you begin to get a sense of how the idea has come together,” he said. Paul adds that after taking part in a social ventures programme last year aimed at finding ways to tackle social issues, he found he had gained the support and advice needed to turn Audrey from an idea into a reality. When users sign up for the service they are first asked to complete an introductory profile about themselves, which includes choosing whether they would like to be a reader, listener or both. “We use the introductory profiles to match people with shared interests, but diverse life journeys, in order that the reading experience is stimulating and meaningful,” Paul said. Reading sessions take place in real time online as either video or audio communications, with experiences comprising five separate 10-minute reading sessions, with Audrey curating books into chapters to fit these sessions. “Our community spend about 10 minutes reading together, and then anything from just a couple of minutes right up to an hour chatting. This usually starts with a conversation about the text, and moves on to wider topics covering almost anything,” Paul said. 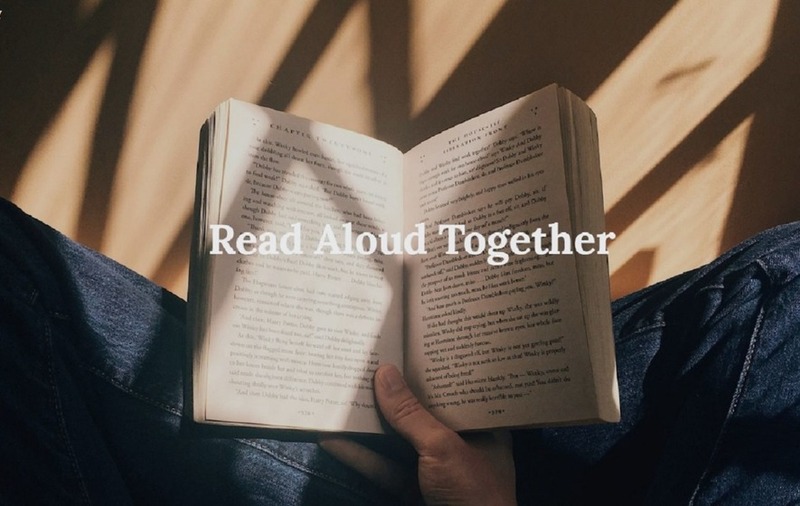 “There’s a real mix of how regularly community members meet to read aloud together. Some reading partners do one regular session each week. Others read together chapter-by-chapter over consecutive evenings. 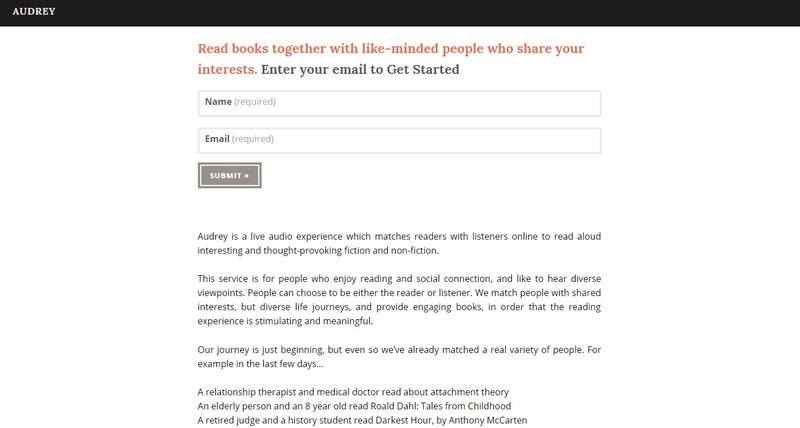 According to the Audrey creator, the majority of users choose to try both reading and listening roles. “There are exceptions here,” he said. “For instance, we have some users who are older adults and they have lost their capacity to read aloud. We also have users who experience dyslexia and prefer to start by listening, in time as they become more comfortable with the experience they read as well. “We have some users for whom English is not their first language and they have joined the Audrey community in order to enjoy listening to English being spoken. The app has also brought together some unlikely pairings to share experiences – Paul says that while the service tries to place together users who have a shared interest, efforts are made to also try and pair those with different life experiences. “Therefore there’s a host of interesting pairings – a 30-something anaesthetist and a retired psychotherapist have been reading together about once a week for several months,” he said. “A professional photographer in London has been reading to an 82-year-old retired nurse living in British Columbia, a retired judge and history student at the University of Liverpool have taken it in turns to read to one another – the history student has just graduated with a first class degree. You can sign up to try Audrey here.